Ever felt dreadfully sick at work and perfectly healthy at home? A chronic headache or an itchy throat at work may be a telltale sign of what’s known as ‘sick building syndrome’. With today’s building practices having our offices sealed up tight, air circulation is a big challenge at best. Our offices are full of environmental chemicals present from paint, furniture, and cleaning products creating the perfect equation for endangering employee health. To keep you and your employees healthy and productive, it’s in everyone’s best interest to maintain a clean air quality. Fortunately, it’s not too complicated. The biggest culprit in air quality control is your heating, ventilation, and air conditioning (HVAC) system. If the system is broken or poorly controlled, maintaining ideal temperatures and humidity will be challenging. During the summer keeping constant A/C cooling and clean ventilation will prevent moisture build up. Moisture in closed off areas of the office like bathrooms and corner rooms are the perfect breeding grounds for bacteria and viruses, which could exacerbate allergies and spread diseases. 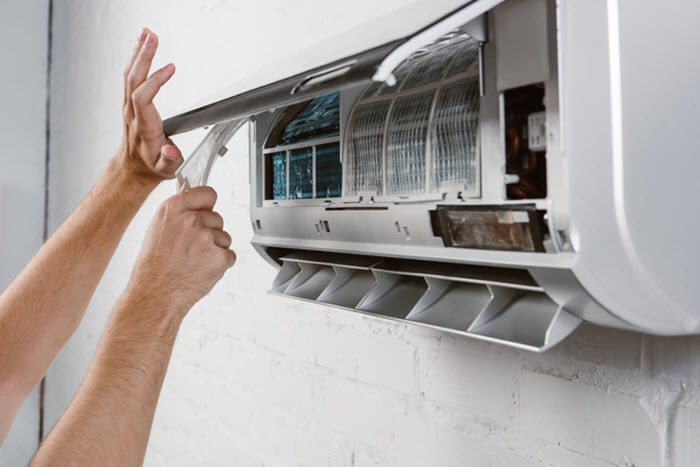 It’s important to make sure to schedule regular maintenance and check-ups to keep your HVAC running efficiently. Replacing air filters is going to be the easiest and fastest way to see a noticeable improvement in air quality. The general rule of thumb is to replace the filters every 6-12 months depending on office size, location, and occupancy. Admit it—we’ve all complained about how the office was too cold or hot. Drastic variations in temperature are not only uncomfortable, they’re expensive. A cost-efficient and convenient way to manage HVAC features is through smart devices like Honeywell’s Smart Thermostat which can be programmed to maintain a balanced temperature without constant manual intervention. Controlling office temperatures will not only improve air quality, but also boost employee productivity. Air purifiers are becoming very popular especially during winter seasons where there is less air circulation. There are a lot of different types of air purifiers that utilize various technologies like high-efficiency particulate air, activated Carbon, UV, negative ion, and ozone. Different models have their pros and cons, but the most common filter technology that you’ll see is HEPA or True HEPA. This technology utilizes fine mesh of several filters to trap outside particles including pollen, dust, mites, and even smoke. More expensive purifiers are branded as “true HEPA” because they can capture and remove up to 99.97% of airborne particles. If your employees are a bit more sensitive to allergens, dust, pollen, or pet dander, investing a little more in true HEPA purifiers like this one can be worthwhile. You can do wonders for the overall air quality by simply performing a daily upkeep of your own space. Desktop vents and furniture easily trap dust and other unwanted particles so make sure to dust regularly. If your office uses a lot of computers and electronic equipment, using electronic dusters regularly will help you maintain a dust-free space. Carpets are magnets for outside guck so wiping shoes on a mat can help trap foreign dirt, bacteria, and chemicals that we pick up outside the office. Regularly vacuuming the carpet with a high quality vacuum that has a HEPA filter can also prevent dust from being blown back into the office space. And don’t be lazy – wipe up any spilled liquid as they can add excess moisture, accelerating mold and mildew growth. Bottom line—do your part for the office well-being and clean your space. Creating a clean-air office environment isn’t an overnight process – it requires resources and individual efforts. Start with healthy habits at the cubicles and dedicate ten minutes of your time to maintain a level of cleanliness and organization. Just remember – great office air quality is a product of small efforts and routine maintenance for building health will certainly go a long way. Investing in maintaining great office air quality will go a long way in promoting health and happiness for your employees.